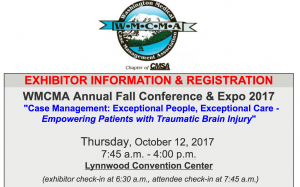 We want you to be a Partner In Case Management Exhibitor at our WMCMA Annual Fall Conference & Expo 2017! For all possible Attendees, visit the EVENT PAGE for the more information and the days schedule. For more information, please contact: rebekahb.wmcma@gmail.com /(425) 329-9456.